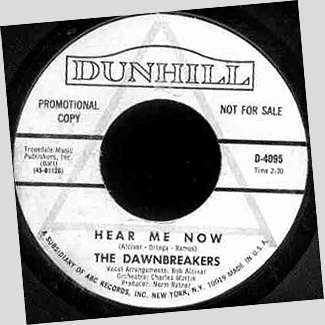 The Dawnbreakers were a group that was formed in about 1966, in Los Angeles. Marcia Day, a highly dedicated promoter, brought the members together at Marcia's Place, a 3-story, grey building that once stood at 7618 Hollywood Boulevard. The group was named for the dawning of realization in the faith, and the vivid teachings of Bahá'u'lláh. Three of Marcia's daughters sang in the group: Billie Lee, who would later marry Dash Crofts; Donnie, who would marry guitarist/producer Louie Shelton; and Lana, who would marry bassist/engineer Joey Bogan. Another daughter would eventually marry Walter Heath, a talented musician that later opened for Seals & Crofts in the 70's. Seals & Crofts joined the group in about 1967-8. It was this influence of the Dawnbreakers (and especially the initial influence of Billie Lee on Dash) that converted the entire group to the Bahá'í faith. They all lived at Marcia's Place together, and were soon joined by Ruby Jean Anderson, Jimmy's future wife. This experience was the the crucible for what would emerge as Seals & Crofts. From a musical standpoint, The Dawnbreakers (in my opinion) sounded much like the Mommas and the Poppas. Their recordings came together with the songwriting and string arranging of Bob Alcivar. Bob worked extensively with the 5th Dimension, and would go on to score and arrange with Seals & Crofts and several others. He would figure prominently in at least three Tom Waits albums. It isn't clear to me whether the Dawnbreakers cut a full length album. Their most visible production was a 45 of "Hear Me Now"/"Looking For Evergreens". These songs are highly rhapsodic. Dash's tenor can be heard clearly through the din of over-production. Regardless of the value of this music, it was a defining time for all the musicians. Jimmy and Dash wrote many of their early songs at "Marcia's Place," with the Bahá'í scriptures providing a flood of inspiration for them. In addition to the lyrical turn, Seals & Crofts forged a new sound on their guitar and mandolin that combined folk, rock, classical and arabescue themes. Dash believes the first of these many songs was "Sea of Consciousness," which would appear on their first album. Bob Alcivar's orchestral scores were very dreamy and understated on that first Seals & Crofts album. Same people, radically different kind of music. A keyboardist with the Dawnbreakers, Andy Cahan, indicates that he wrote two songs with Jimmy in about 1968. His background and two pictures he took of Seals and Crofts are here.